We had the opportunity to attend the CECAM-Workshop “Crystal defects for qubits, single photon emitters and nanosensors” in Bremen (Germany), an interesting and forefront workshop in crystal defects for quibits. 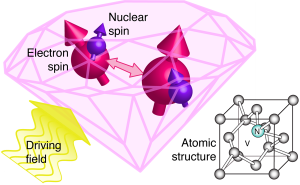 Since we all know, the leading contender is the nitrogen-vacancy center in diamond which may be considered as a robust quantum tool. Several quantum algorithms and protocols for sensing have been already demonstrated by this center. However, researchers face many materials science problems in order to maintain the favorable intrinsic properties of this color center that can be perturbed by other defects either in bulk or at the surface of diamond that is difficult to resolve because of its chemical hardness and the concurrent stability of carbon allotropes. Theory-driven search for alternative materials could identify other quantum bit candidates in technologically mature wide band gap semiconductors, particularly silicon carbide, that have been recently demonstrated in experiments. However, the knowledge about these color centers is scarce. David Awschalom (University of Chicago, Illinous) Adám Gali (Hungarian Academy of Science, Wigner Research Centre for Physics, Budapest) Audrius Alkauskas (Center for Physical Sciences and Technology, Vilnius)Sophia Economou (Virginia Polytechnic Institute and State University Blacksburg, Virginia) Ronald Hanson (Delft University of Technology) Marcus Doherty (Australian National University, Canberra) Arne Laucht (University of New South Wales, Sydney) Fedor Jelezko (Ulm University). During this meeting we could exchange ideas of methods to use, and listen to discussions of new developments between scientists working on different aspects of diamond, silicon carbide and related materials. The interdisciplinary character of this workshop was a unique opportunity for me to learn and to have a better idea on which problems I should focus. Stay tuned! this research topic is very promising and will lead to nice discoveries! *Image taken from APS/S. Benjamin and J. Smith.